Two of my favorite Tudor-era novels are Margaret Irwin's 1944 novel Young Bess, about Elizabeth I before she came to the throne, and its 1948 sequel, Elizabeth, Captive Princess. Linda Porter's just-published biography of Katherine Parr, Katherine the Queen, sheds light on one of the most interesting characters in Young Bess aside from Princess Elizabeth herself. As one of Henry VIII's many queens, Katherine was Elizabeth's stepmother. As his sixth and last queen, when Henry died in 1547, Katherine became Elizabeth's surrogate parent along with Thomas Seymour, the new husband she married hastily and in secret within six months of Henry's death. 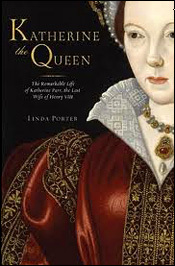 It was great to talk with Linda Porter on November 30, 2010, about Katherine the Queen, her just-published biography of Katherine Parr, and the relationship of Katherine and Elizabeth. Since 1944, has any new information come to light that you feel either corroborates or contradicts Irwin's fictional vision? I think views of Katherine have changed radically. She was a feisty, ambitious woman who enjoyed the privileges of being queen and who did not want to lose them when Henry died. My view is that she certainly was in love with Seymour but saw marriage to him as potentially politically advantageous, too. Katherine's fourth husband, Thomas Seymour, played sexually suggestive games with Elizabeth while she was in their care, which almost led to Elizabeth's undoing. Do you think Katherine understood how risky those games were? There is evidence that her initial feeling that this was all harmless horseplay gave way to concern as her pregnancy progressed. And she reminded Elizabeth, in no uncertain terms when she sent her away in spring 1548, that the princess needed to guard her reputation. As you delved into the historical records documenting Katherine's relationship with Elizabeth, did you uncover any details that surprised you? One thing that did surprise me was that Elizabeth defied Katherine’s advice on the appointment of a new tutor when William Grindal died suddenly at the beginning of 1548. Katherine wanted to employ a gentleman in her own patronage but Elizabeth insisted on Roger Ascham. This suggests that the queen’s influence over Elizabeth was far from comprehensive.